This article is about the character from the Star Fox series. For the Big Bad Wolf that appeared in the The Super Mario Bros. Super Show!, see Big Bad Wolf. Wolf is dropped in by a Wolfen. Wolf O'Donnell is the longtime rival of Fox McCloud, who appears in the Star Fox series of games, making his debut in Star Fox 64. He is the leader of the Star Wolf wing, a rival team to Fox's Star Fox team. Wolf later appears as an unlockable playable character in Super Smash Bros. Brawl. After a ten-year playable absence in the Super Smash Bros. series, he reappears in Super Smash Bros. Ultimate for the Nintendo Switch. Wolf makes a minor appearance during the intro of Super Smash Bros. Melee. When Fox flies by a Wolfen, the screen splits to show Fox and Wolf inside the cockpits. Wolf's appearance in Super Smash Bros. Brawl. Wolf is one of the unlockable characters in Super Smash Bros. Brawl, using his appearance from Star Fox: Assault and is voiced by Jay Ward. According to Masahiro Sakurai, Wolf was nearly cut from the game due to time constraints. He is both the biggest and heaviest of the Star Fox characters. He is not as fast as Fox and Falco, but his attacks are more powerful. His aerial speed is better than that of Fox's and Falco's. He can be unlocked by having him join the party in The Subspace Emissary, playing 400 Brawl matches, or by clearing Boss Battles with either Fox or Falco, then defeating him on Lylat Cruise. Though his special moves are based on the basic design of Fox's special moves, they have been altered for Wolf, with new effects for all of them. All his standard moves are different as well. 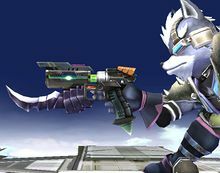 Wolf's standard special move is the Blaster, though unlike Fox and Falco's the gun has a claw-like extension that damages nearby opponents. His side special is Wolf Flash, which gives Wolf some vertical height and has a meteor smash at the end. His up special is Fire Wolf, in which Wolf instantly charges in the direction held on the control stick, the air surrounding him damaging opponents. His down special is Reflector, which has a different visual effect than the other characters' Reflectors and increases the speed of reflected items and projectiles rather than power. His Final Smash is the Landmaster, his version having more firepower and sporting Wolfen coloration. Wolf also appears in all of the Star Fox character Smash Taunts on Lylat Cruise. 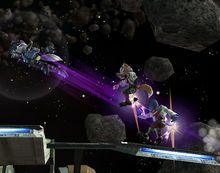 In the Subspace Emissary, Wolf doesn't play a major role and does not interact with other video game characters, but can join the player's party after beating Tabuu, along with Jigglypuff and Toon Link. The player must enter a special Red Door in The Ruins stage, which will take them to Lylat Cruise. The player sees Wolf flying his Wolfen. He then jumps out of the Wolfen, and lands on the cruise. Wolf strikes a pose and then rushes at the player attacking him or her. The player must then defeat Wolf in a one-life stock battle. After defeat, he joins the party. 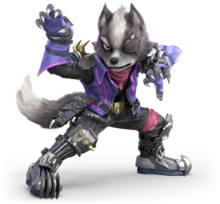 While Wolf does not return as a playable character in Super Smash Bros. for Nintendo 3DS and Super Smash Bros. for Wii U, he still appears as part of the smash taunt on Lylat Cruise in Super Smash Bros. for Wii U. Wolf also appears as a trophy in both versions of the game. Finally, some of Wolf's moves have been implemented as custom special moves for Fox, and Fox also has a palette swap that references Wolf. Wolf reappears for the first time as a playable character since Super Smash Bros. Brawl in Super Smash Bros. Ultimate, where he has been redesigned to match his appearance in Star Fox Zero. To reflect upon this, Wolf is now voiced by Mike West, who voiced the character in Star Fox 64 3D, Star Fox Zero, and Starlink: Battle for Atlas. Additionally, the majority of his moveset is also updated to reflect his new design, while he takes on a more upright posture during battle. Wolf is also much more nimble. He also has a new Final Smash involving other members of Star Wolf. Wolf's Classic Mode route has him battling characters who are not fighters in Super Smash Bros. for Nintendo 3DS / Wii U, but are fighters in at least one prior Super Smash Bros. game. Galleom's appearance as a boss references its absence from the 3DS and Wii U games. The Blaster is Wolf's standard special move, which he shares with Fox and Falco. When used, Wolf pulls out his Blaster and fires a laser with a limited range to damage opponents. Out of the three Star Fox characters, Wolf's Blaster has the least range and the lowest firing rate, but shots deal the greatest damage and knockback out of each character, though the damage decreases as the blasts travel further. Wolf's Blaster also has a claw-like bayonet attached to the front that also damages opponents. Wolf Flash is Wolf's side special move, equivalent to Fox's Fox Illusion and Falco's Falco Phantasm. When used, Wolf flies directly forward in a streak of light which damages any opponents in his path, though the move also sends him upward at an angle. In addition, the move has a sweet spot when Wolf is about to stop that deals a greater amount of electric-based damage as well as meteor smashing opponents. When using Wolf Flash in the air, the move leaves him helpless afterward. 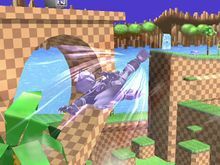 Like Fox Illusion and Falco Phantasm in Super Smash Bros. Brawl, Wolf is able to cancel this move by pressing the special move button again. Wolf Flash also appears as Fox's second custom variant for Fox Illusion in Super Smash Bros. for Nintendo 3DS and Super Smash Bros. for Wii U. Fire Wolf is Wolf's up special move. It is the equivalent to Fox's Fire Fox and Falco's Fire Bird; unlike them, however, Fire Wolf does not have a charging period, and Wolf flies directly ahead, dealing multiple hits as he goes before finishing with a kick. The move travels farther than Fire Bird, but not as far as Fire Fox. The move also creates air streaks that deal damage rather than covering Wolf with fire. 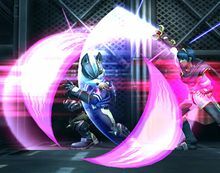 The Reflector is Wolf's down special move, shared with Fox and Falco. When used, an energy barrier appears around Wolf that reflects projectiles, increasing the amount of damage they deal when they hit. The Reflector itself also damages nearby opponents, though it is not invulnerable to physical attacks. Wolf's Reflector has a different design from Fox and Falco's, being a purple shield on both sides rather than a blue hexagon shape. Wolf's Reflector also does not give reflected projectiles as much power, but it instead increases their speed. 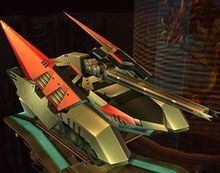 The Landmaster is Wolf's Final Smash, shared with Fox and Falco and based on the Landmaster first used by Team Star Fox in Star Fox 64 / Lylat Wars, although its design is specifically based on its appearances in both Star Fox 64 and Star Fox: Assault, recolored to match the ships used by Star Wolf, the Wolfen. Upon activating the move, Wolf leaps into the air and falls back down inside the Landmaster. Compared to Fox and Falco's Landmaster, Wolf's has the greatest attack power and movement speed, both on the ground and in the air, though it does not last as long as the others. The Star Fox team’s greatest rival is Team Star Wolf. Sitting at the head of this group is Wolf O’Donnell. Wolf fights with his razor-sharp claws in a style that’s downright feral. His high risk, high return special moves are a blast to use. N64 Star Fox 64 A pilot whose real name is Wolf O'Donnell. He leads a group of mercenaries called Star Wolf. He's crossed paths with Fox many times, and each acknowledges the other as a competent rival. Wolf's constant interference with Fox is a result of Wolf's history with Fox's dad, James. Wolf's long history of criminal enterprise has resulted in a large bounty on his head. Wii Super Smash Bros. Brawl Wolf's Final Smash. Wolf analyzed Fox's Landmaster and built his own improved version, which he now calls out and boards. He's increased the output of the onboard generators and upped the vehicle's firepower. However, this has substantially decreased the time the Landmaster can appear on the screen. It sports the same colors as Wolf's Wolfen. Colonel: You mean the fighter named Wolf. Colonel: He's the leader of a ragtag team called "Star Wolf". They're the longtime rivals of Star Fox. Snake: Kind of strange for a wolf to have friends, isn't it? Colonel: Well, I don't think he works well with others. I suppose they're more like hangers-on than actual comrades. But he's a remarkable pilot. And his ship, the "Wolfen", is no slouch, either. Snake: But this is hand-to-hand combat, Colonel. He's out of his element. Colonel: Careful, Snake. Those claws of his aren't just for show. GCN Star Fox: Assault (02/2005) Wolf used to fight in Andross's army, tangling with Star Fox in battle after battle. After Andross's exile, he went his own way and formed a mercenary team called Star Wolf. He and his eternal rival, Fox, have even fought on the same side from time to time...but inevitably, they always meet again as enemies. Wolf used to fight in Andross's army, where he tangled with Star Fox in many a dogfight. After Andross's exile, he went his own way and formed a mercenary team called Star Wolf. He and his eternal rival Fox have even fought on the same side from time to time...but inevitably, they always meet again as enemies. Pit: Now this guy seems bad to the core! Palutena: That's Wolf. He's Fox's archnemesis and the leader of Star Wolf. Star Wolf is a group of mercenaries hired by Andross. Palutena: Generally speaking. Although, Star Fox is also technically a mercenary group, but they would never aid someone as evil as Andross. Viridi: Wolf may be Fox's nemesis, but there's also a mutual respect between them. They even fought on the same side at one point. Palutena: Kind of like Pit and Dark Pit. Dark Pit: What?! We're nothing like that! I DON'T respect him and we're sure not all buddy-buddy! Palutena: See, you guys are just like them. Palutena: In any case, Wolf's Blaster shoots long-range projectiles, but it can also be a nuisance at close range. This page was last edited on March 26, 2019, at 21:37.